Open, Transparent and Fair environment is healthy for procurement system, and should be conducted in the same manner. Modern practices and principles enforce to underline unrestricted environment in procurement system. It is a broadly accepted principle of all time. Can be defined as timely ,easily understood to the available information, it also protects the image of the process and the interest of the organization, Stakeholder and the public. CFO’s of all organizations almost have the dream to reduce millions of money in costs, through different ways and to become the most attracted leader of there organizations in a shortcut ways few simple rules to be followed by the CFO’s to retain the attention in the procurement sector. In simple words Performance Management can be defined as the process of evaluating, measuring and monitoring supplier performance and supplier’s business process and practices for the purposes of reducing costs, mitigating risk and driving continuous improvement in your purchasing process. The relationship between a large complex organization and its key suppliers is normally more than just "strategic". A Vendor is a third party that supplies products or services to an enterprise. These products or services may be outsourcing, hardware, software, services, commodities, etc. Vendor management is a strategic process that is dedicated to the sourcing and management of vendor relationships so that value creation is maximized and risk to the enterprise is minimized. This process requires dedicated effort from the enterprise and the vendor. People, Planet or Profit! What is the Priority? The organizations spend huge money to deliver high quality, and achieve value for money, goods, services and sustainable savings. The objectives stimulate the markets to develop strategies and innovative processes which support triple‐bottom line outcomes. The triple bottom line i.e. people, planet and profit was first explained by John Elkington in his 1997 book "Cannibals With Forks: The Triple Bottom Line of 21st Century Business". It's a bottom line that continues to measure profits, but also measures the organization's impact on people and on the planet. Triple Bottom line Procurement is a strategic approach to meet organizational objectives through procurement as it involves using procurement processes and purchasing power to generate positive TBL outcomes in addition to the delivery of efficient goods and services. It is the right time to take steps towards triple bottom line and ensure TBL Procurement readiness through securing leadership support, building awareness and understanding across the organization. At the same time organization’s procurement policies, frameworks and process also needs to be reviewed to incorporate social outcomes and early identification of TBL opportunities through strategic procurement. Poor data visibility is something that can have an effect on an organizations entire operations process, whether from technology point of view or sales activity. With increasing competition globally and margins for error is less the wrong selection can create negative impact on entire organization. Data visibility is a key to any important decision-making process, however it not only includes having access to all the relevant information, but having pertinent information available at the right moment. Andy Lewis, CIO of Kovarus (Integrated IT Expertise) said “It is critical to first understand where you are now and how you can adapt what you have before you can effectively adopt and integrate new technology innovations”. Most of the times Procurement professional faces hard time especially when they are in a process of negotiation with single source supplier and that even get worse when commodity is highly consumable. 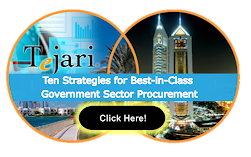 So here is the strategy which can help procurement specialist to negotiate with single source supplier. SaaS, or Software as a Service, describes any cloud service where consumers are able to access software applications over the internet. The applications are hosted in “the cloud” and can be used for a wide range of tasks for both individuals and organisations. Salesforce, NetSuite and BravoSolutions are the best examples of SaaS, with users able to access the services via any internet enabled device. Enterprise users are able to use applications for a range of needs, including accounting and invoicing, tracking sales, planning, performance monitoring and communications. Adding Value Is Important Than Saving Cost! Nowadays it is very critical for organizations to control their expenditure and identify new sources of supply to achieve cost savings. At the same time, it is imperative for product or service provider to demonstrate value for money for its customers where they cannot compromise on the quality of their offered products and services. Vendor relationship is one of the key factors for adding value to organizations purchasing process and for a successful vendor relationship, it is crucial to communicate your organizational goals, business vision, and your expectations to vendors. This will surely encourage them to work harder to improve the quality of supplied products or services as knowledge about customers goals can always help vendors to make the best decision in customers favor. The most important factor to keep vendors’ interest intact in your business is to answer the vendors’ queries as promptly as possible. This will surely give them a sense of confidence and trust you have developed by making them a strategic partner in your organization’s success. Also avoid delays in payments, unless unavoidable, as it strains relationship, however an amicable solution for an appropriate payback period can be discussed with the vendor to minimize an adverse effect of squeezed fund position on all stakeholders. The Supply Chain Teams should also show loyalty to vendor by frequently giving them business resulting into enhance motivational level, vendor may return the favor by offering discounts and incentives. This is how you add value to your purchasing process by ensuring timely and effective service by the vendor which is more crucial than cost savings most of the times. Vendor risk Management - “Ensures Value for Money & Manages Complex Risk”. Vendor Management plays strategic role in supply chain efficiency. Managing vendors can increase cash flows, provide excellent service,improve reliability of supply it also helps in reducing reliance on capital assets and can be an alternate source.